Having trouble uninstalling a program? The Revo Uninstaller will remove hard to remove programs. Have you decided to remove a program you installed many years ago but couldn't remove it. You might have gotten an error stating file not found or the uninstall never starts. This type of problem happens when Windows updates alters the way the windows installer or can happen if you upgraded to a newer version of Windows. In either case the Windows installer / uninstaller may no longer support the install method of that older program on your PC. What not to do is erase the files of the program as that may cause problems with your PC. When programs are installed they enter information into the Windows Registry about the application. If those entries are also not removed that may cause a system crash depending on what type of program was installed. The answer is Revo Uninstall. Revo Uninstall will first run the normal windows uninstall and then scan the PC by checking the Hard Drive and the Windows registry for any files or entries left by the application. 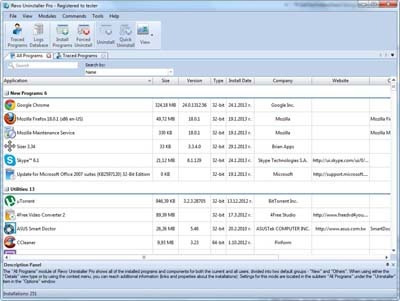 After it finds everything related to the program it will list them for you to look over and allow you to delete them all removing them all from your PC. I have used this program for many years now and find it to be of great value. It helped when I upgraded to Windows 10 where I had a few programs that stopped working proper and had to be installed again. The problem was that when I tried to install them they wouldn't install. So I tried to remove them using the Windows uninstall and also no luck. Using the Revo uninstaller took out the problem apps and I then had no problems installing them after a successful removal. Using it is as easier than the Windows uninstaller. You launch it and you get a screen that lists all programs that in listed as installed in your PC. It shows either icons, list view or details view which shows the size of the program, Date it was installed, type (32 or 64 bit), Version, Company name and location of it. For Programs that are not listed it has a Hunter mode which when launched has a small blue box which appears on your screen. Place that box over a desktop icon, a folder in windows explorer / file explorer or over a running program. It will find it and remove it. This is a feature I never had to use but I am sure there is a need for it and it's nice to know it's there. The program has other features which are nice but I will limit my review to just the uninstall which is the main reason one would buy it. Revo has a free 30 day trial of the Uninstaller Pro which is available on their website at VSRevo Group.